Marble countertops will instantly enhance any bathroom. When renovating your bathroom, you want to incorporate materials that are highly durable, and more importantly, water resistant. You will spend a lot of time in your bathroom at your sink washing your hands and getting ready for the day. Marble is a beautiful and pristine material you should install around your sink. There are several benefits of bathroom marble countertops that your family will love for years to come. One of the most attractive features of marble is that it is an incredibly strong and moisture resistant material. Marble is the perfect material to install into your bathroom because water will not damage or destroy it. Compared to other countertop materials such as granite, marble is scratch resistant, so it will constantly retain its beauty. The countertop material stands up well to everyday wear and tear so it will look good as new no matter how many items you store on it. Once your marble countertops are installed in your bathroom, you will notice a change almost immediately. 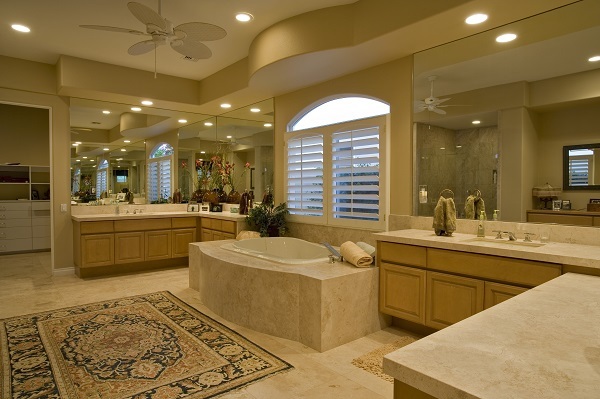 Marble countertops will elevate the feeling and look of your bathroom making even the smallest bathroom feel expensive. Marble is an aesthetically pleasing material that comes in a wide range of style and colors. The material comes in a variety of natural-looking designs. Natural looking stone gives any room some luxury and elegance. You can match marble to your current home decor easily. Marble will immediately eliminate any gloominess or darkness in a small bathroom. The shiny and smooth texture of marble will add some well-needed dimension to your space. You can heighten the mood and feeling in your bathroom with bright colored marble. This entry was posted on Friday, October 20th, 2017 at 1:54 pm. Both comments and pings are currently closed.